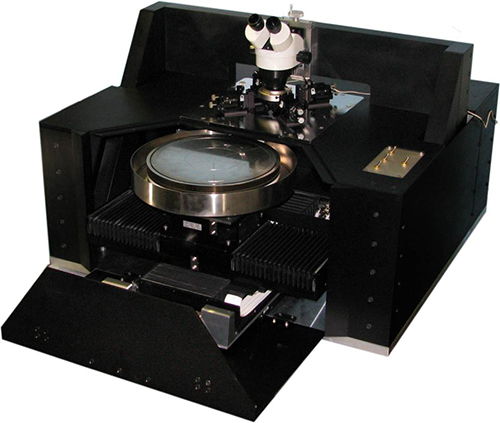 The SPS 2600, SPS 2800, and SPS 12000 Series systems are MicroXact’s semi-automated probe stations designed to be flexible and easy to use when performing high productivity device characterization, wafer level reliability testing and failure analysis. These semi-automatic probe station systems are designed to support manual and semi-automatic probing of up to 200mm wafers. As semiconductors become smaller and more complex, it has become necessary to more closely monitor and control production, especially further upstream in the process. Wafer level reliability testing performed with MicroXact’s semi-automatic probe station gathers data through series of stress tests to identify irregularities that could affect the long-term reliability of the device. Although not always needed, further and extensive failure analysis can be performed after the wafer level reliability testing. These semi-automatic probe station systems are built on a heavy-duty, versatile platform capable of being configured to handle a wide range of probing applications. With a variety of options available, including heated/cooled wafer chucks, standard or digital microscopes, and programmable stage indexing, MicroXact’s semi-automated probe stations offer a cost-effective and easy-to-use solution for all your high productivity device characterization and wafer level reliability testing needs. Three options (standard, high-precision, and high-speed) are available for these semi-automatic probe stations. Precision motor control of XY stage and platen. Also available with additional preload slide for easy loading and unloading of wafers or samples. Smooth powder-coated steel platen holds up to 10 magnetic or vacuum-based positioners. Isolated feed through terminals located on both sides of station for convenient connection to micropositioners can be customized for BNC, Triax or Banana plug connections. Standard boom mount assembly for full-range XYZ positioning of microscope. 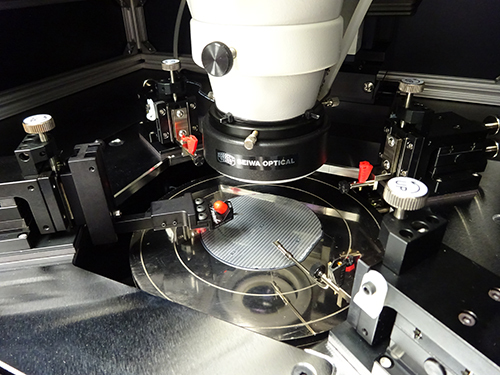 Available high-resolution micropositioners with 80TPI screws for μm-level positioning of probes. RF options available include customizable RF probes, RF bias-able chuck, and shielding enclosures. RF biasable chuck and shielding enclosures. Polished gold-plated adjustable vacuum chucks. Thermal chuck with temperature range of -65°C to >400°C (higher temperatures are possible as well). Adapted systems for ultrasonic and laser cutting. Optional choice of XY translation stage and extra-sturdy welded steel bridge for high-resolution microscopes.